Little Fox waits tentatively, quietly. He thinks that even if his mother cannot see him, she might be able to hear him. 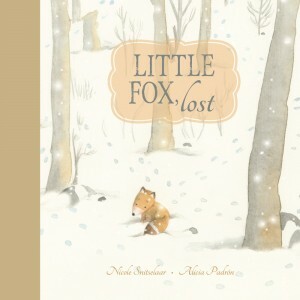 He begins to sing, and gradually other forest animals join in the chorus to alert Mama Fox to where her little one is. Of course, there is a happy ending as Mama arrives, coming to take Little Fox back to their den to curl up together to sleep. Snitselaar has written a pleasant, if not highly original, story that will reassure young listeners about parental love. Soft sepia-toned illustrations show simple animal figures on a white background that imparts a chill winter feeling.